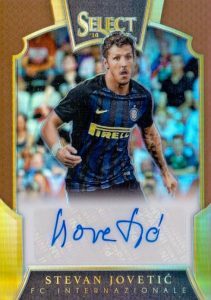 The sophomore edition of the popular release, 2016-17 Panini Select Soccer relies on the signature Select look along with plenty of autographs, relics and parallels. Each hobby box includes a trio of hits. Similar to the three hits found in the debut set, collectors should find one autograph and two relics per box. However, it is worth pointing out that this is "on average" and not necessarily a box guarantee. The rather large base set of 300 cards is composed of three different 100-card subsets set around a stadium seating theme. Terrace is the most common, followed by Mezzanine (10 per box), and Field Level (1:6 packs). Of course, there are also multiple colorful parallels that apply to each base version. 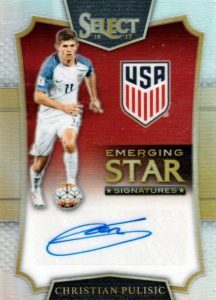 Covering previous eras as well as current and future stars, the 2016-17 Panini Select Soccer autographs average one per hobby box. Choices include the main Signatures in addition to Emerging Star Signatures and Historic Signatures. Various parallels are also in play here, including Orange. The checklist offers confirmed first-time signers Antonio Conte, Julio Salinas and Mauricio Pochettino. 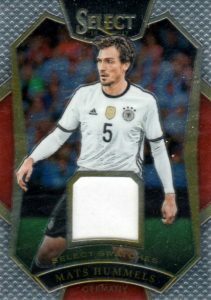 Similarly, relic cards are another box hit in 2016-17 Panini Select Soccer. Among the options, Memorabilia inserts showcase a horizontal layout and parallels such as Tie-Dye. 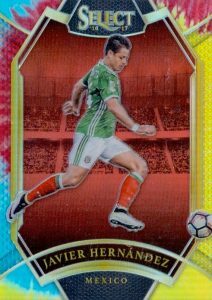 Finally, 2016-17 Panini Select Soccer contains one standard insert per box. Sky's The Limit is one such choice and centers on images of aerobatic feats. PARALLEL CARDS: Orange #/75 or less (*No cards #1, 8, 25, 27), Neon Green Die-Cuts #/60 or less (*No cards #1, 27), Copper #/49 or less (*No cards #1, 15), Tie-Dye #/30 or less (*No card #1), Gold #/10 (*Cards #2, 5 - #/7), Green #/5, Black 1/1. PARALLEL CARDS: Orange #/75 or less (*No card #6), Neon Green Die-Cuts #/60 or less, Copper #/49 or less, Tie-Dye #/30 or less, Gold #/10 (*Cards #4, 6 - #/7), Green #/5, Black 1/1. PARALLEL CARDS: White #/99 or less, Neon Green #/60 or less, Tie-dye #/30 or less, Gold #/10 (*Cards #1, 2 - #/7, 50 - #/8), Green #5, Black 1/1. Does Panini Select 2016 cards have FC Barcelona players wearing FC Barcelona jersey? 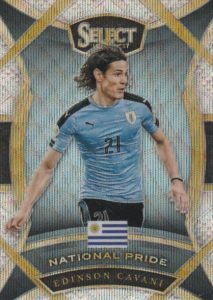 Or Panini Select 2016 it is only wearing National Teams Jersey? Because in the image Neymar is actually wearing the FCB Jersey. I find 19 players with Barcelona team name on the list But I can’t find any card where this players are actually wearing the FCB jersey. For me. great players on the National team jersey are NOT attractive. Instead Club jerseys are always great. It has both but seems to be more of the National Team images. It should match up to the team noted for each card. Busted a box. 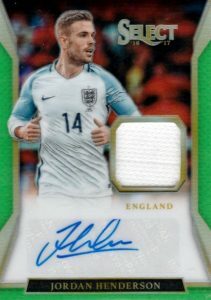 Bale auto out of 20. Neymar Prism out of 10, some other great hits. They know how to make this product! If it is so good, why is there not an auto in every box? I’ve watched break after break of this product, and out of a case, breakers are pulling 6 autos. When panini says ‘1 Autograph per box on average’, what does that actually mean? If it means every second box, it should say that. We report the most accurate information possible at the time it is announced but clearly something changed. Instead of one autograph and one memorabilia card in every box, like was originally solicited, it is now an average of one autograph and two memorabilia cards per box.